Edmonds, Washington, is a suburb of Seattle, Washington. It is located to the north of Seattle. 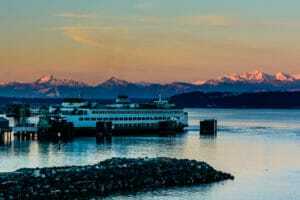 The Olympic Mountains and the Cascade Range as well as the Puget Sound are part of the daily scenery. HistoryThe city was founded by George Bracket, a logger. He was searching for timber when his canoe became beached in an area that is referred to as Bracket’s Landing. The city was named Edmonds in 1884 but was not incorporated until 1890. An extension of the Great Northern Railway was built in 1891, bringing hopes of prosperity. Unfortunately, the Panic of 1893 caused the town owners to foreclose, but Bracket was able to recover. With the help of other citizens, he developed the city’s infrastructure. Regular steam-powered passenger ferry service was established by 1900. Many buildings were lost to major fires in 1909 and 1928. In 1911, the first car became a fixture in the city. This lead to more road building, creating more residential and commercial growth. In 2016, the United States Census Bureau estimated the population of Edmonds was 41,840 living in 17,456 households. Those with a high school degree or higher comprised 96.1 percent of the population, and those with a Bachelor’s degree or higher comprised 48.8 percent of the population. The median per capita income was $47,113 and the median household income was $78,181. In 2016, 71.7 percent of the 18,378 housing units were owner-occupied. The median value of owner-occupied housing was $413,000. The median monthly cost with a mortgage of owner-occupied housing was $2,072. The median monthly cost without a mortgage of owner-occupied housing was $690. The median monthly rent was $1,208. The Puget Sound Express offers a half-day whale watching tour from April 27 until October 27. The tours depart daily at 9:30 am. Between June 1 and September 9, an afternoon tour that departs at 2:30 pm is added. The tours last four to five hours. It takes about an hour to get across Puget Sound to the San Juan Islands. The whale watching area should be reached about 90 minutes after departure. You can expect to see orcas, humpbacks, and minkes along with dolphins, sea lions, seals, and sea birds. The Southern Resident orcas in this area are from one clan and belong to the J, K, and L pods. Offspring stay in the pods with their mothers for life and form sub-pods. The oldest female is the heart of a pod. The three pods have calls in common that are different from pods in other areas. They also have calls that are pod-specific to one of the three pods. The calls can be heard up to ten miles underwater. Puget Sound Express has been offering whale tours for three generations in an area with an extremely high concentration of whales and other sea creatures. They belong to the Pacific Whale Watch Association (PWWA) that supports responsible marine wildlife viewing. With all this experience, they guarantee you will see whales or you will get another excursion free. Be sure to make your reservation early. At the time you make your reservation, you can decide if you want to buy a ticket for a child under two. If you do not buy one and the boat is full, your child will have to sit in your lap. You can also order box lunches when you make your reservation. The Puget Sound Express departs from a dock at 500 Admiral Way, Lot 9. You must check in 45 minutes prior to departure and boarding closes 15 minutes before departure. • Dress warm because it will be cooler on the water. • Wear a hat, sunglasses, and sunscreen. Make sure the hat will not blow off in the sea breezes. • Wear flat, rubber-soled shoes to avoid slipping on the deck. • Neck straps are recommended for cameras and binoculars. • This is a four to five hour tour. So, you may want to bring some books to keep children occupied. • Seasickness medicine should be taken one hour before departure. The Future of Flight Aviation Center and Boeing Tour is a tour of the Boeing factory. It provides a unique experience watching the building of 747s, 777s, and 787s. You can sit in the cockpit of a 727 and operate the controls. You can also view a mockup of the International Space Station Destiny Laboratory in the Aerospace Gallery. It is located at 8415 Paine Field Blvd in Mukilteo, Washington and is open daily from 8:30 am until 5:30 pm. To maximize your rental property investment, call us for a comprehensive market analysis. Our property management team specializes in residential areas throughout Edmonds, WA. We offer multiple services to take your rental property and convert it into reliable income. We have a thorough screening process that helps to identify the right tenants for your property. Our team works hard to keep both parties happy through effective communication, bullet proof lease agreements, and timely monthly rent collection. We offer maintenance services to enhance the property and ensure that it will retain or increase in value. We oversee everything, allowing you to sit back and relax and know that your property and your tenants are in good hands. Contact us today if you are ready to receive a comprehensive analysis of your rental property and to inquire about our Edmonds area property management services.